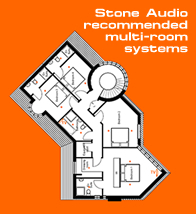 Ferguson Hill are an established independent UK specialist in high end horn loaded loudspeakers and hi-fi components. Founded in 2003 by former aeronautical engineer Timothy Hill, the company arrived on the hi-fi and audio scene with the design, manufacture and launch of the groundbreaking FHOO1, the world’s first ever front loaded horn dipole loudspeaker. The Ferguson Hill loudspeakers are full range units from 150Hz-20KHz, with no crossover, however a sub bass unit is required below 150Hz. They produce music with a high level of clarity, detail and dynamics, are highly efficient, and will go loud with just a few watts (5 watts). This allows their use with relatively low powered amplifiers, further increasing the level of clarity obtainable from such relatively 'simple' amplifier circuits.